After a delicious breakfast at The Pullman Resort we headed off to Da Nang Airport to catch our 8:45 flight. For domestic flights in Vietnam, you should arrive at least an hour early, as check in closes forty minutes prior to departure. We had checked in online the night before, so we only needed to check our bags. After checking our bags and going through security, we headed towards our gate, which was changed last minute. So, be sure to listen to the announcements overhead when walking through the airport! When Jess booked this early morning flight, she didn’t consider that by selecting seat 7A she would be obligated to get drunk on a plane. 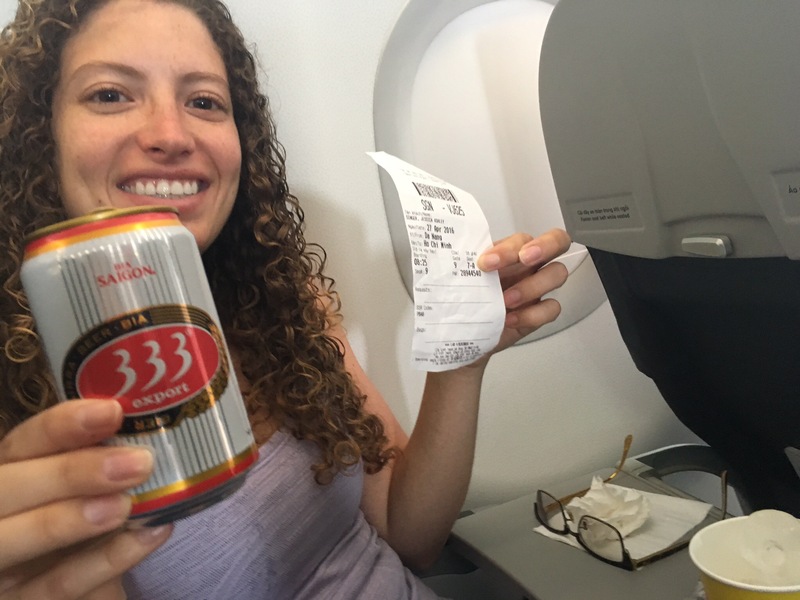 Yet again, Vietjet only stocks 6 beers per flight so she was in luck, and ordered one (which we shared). When we arrived at the Ho Chi Minh City Airport we deplaned and were driven by bus to the baggage claim. This time, both our bags came quickly and even came out at the same time! After grabbing our packs, we had to exit through a baggage check where airline staff ensured that the tag on your luggage matched the tag placed on your ticket when you checked your bag. This is by no means a fool proof way to prevent theft, so always remember to look for your bags right when they come out on the conveyor belt. After exiting the baggage claim area, we walked over to the taxi stand and after a quick comparison learned that yet again, uber would be a much cheaper means of transportation compared to standard metered taxis. After a quick search through reviews on Trip Advisor and Agoda, we decided to take a look at the Millennium Boutique Hotel in District 1. On our arrival we asked if they had availability, and if we could see a room before booking. We were showed to a room on the 8th floor and, while it was small, it appeared clean and modern. After a quick check for signs of bed bugs, we were satisfied and said we would take the room. The hotel initially quoted us a price well above what we saw online. When we brought this to their attention, they honored, and actually beat the Agoda rate and included breakfast in our stay. The hotel is rated as a 4 star hotel due to the amenities they offer, including a rooftop pool. We found the staff to be very courteous and eager to help make our stay enjoyable. 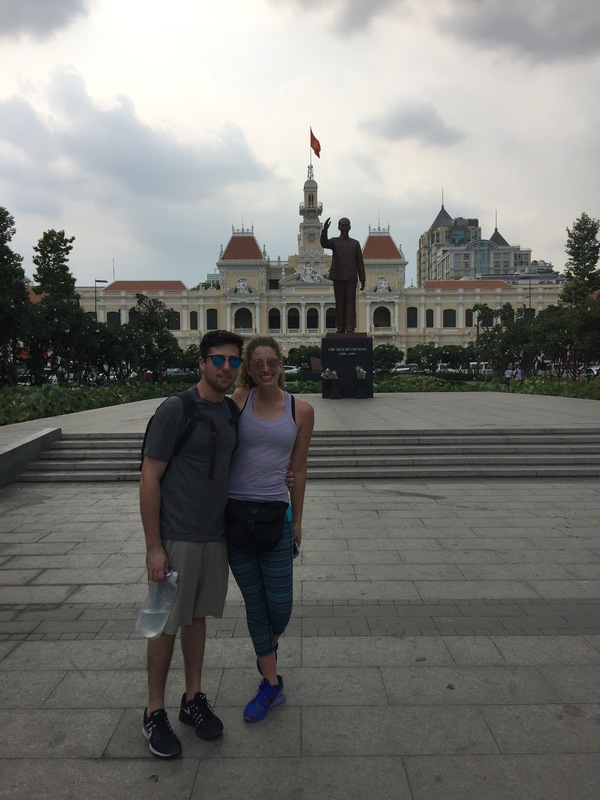 After settling down in our room, we decided it would be a good idea to walk through Ho Chi Minh City and see some of the sights that were close to the hotel. Our first stop was the Saigon Opera House, which was closed at the time, except for the ticket office. Unfortunately there would be no shows during our time in Ho Chi Minh City, but we were able to appreciate the beauty of the building built by the french in 1897. It was definitely cool to see, but I wouldn’t go out of the way to see it again unless you have a deep appreciation for French Colonial architecture, or your able to get tickets to see a show at the opera. 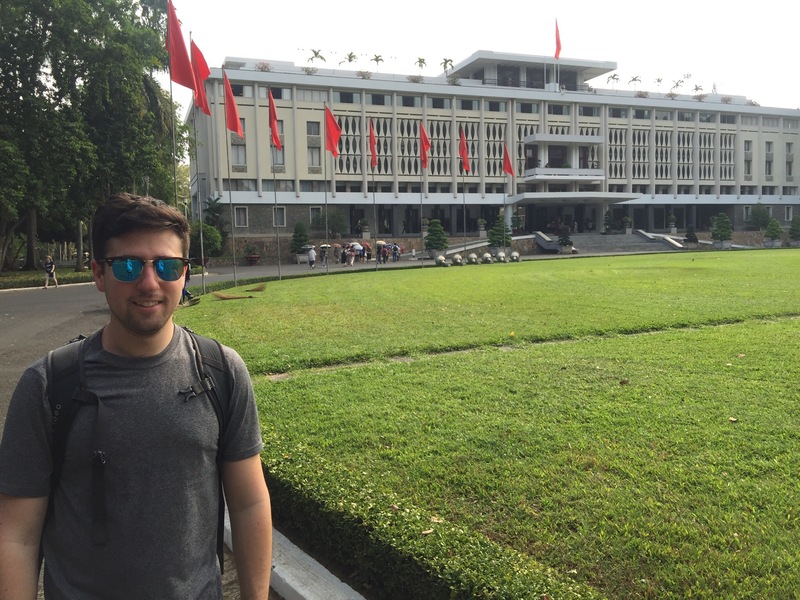 After walking a few blocks, dodging motorbikes in the street AND on the sidewalk, we found ourselves at the Ho Chi Minh City Hall. Built in the early 1900’s, the french colonial city hall now serves as the headquarters of the Peoples Committee. The building was much more impressive than the opera house, and from what I’ve heard is lit up beautifully at night. The building is closed to foreigners, but you may take pictures from outside. Across the street from the Ho Chi Minh City Hall is an expansive park where a large bronze statue to Ho Chi Minh is located such that he is looking out towards his followers. Our next stop was the Ho Chi Minh Museum. 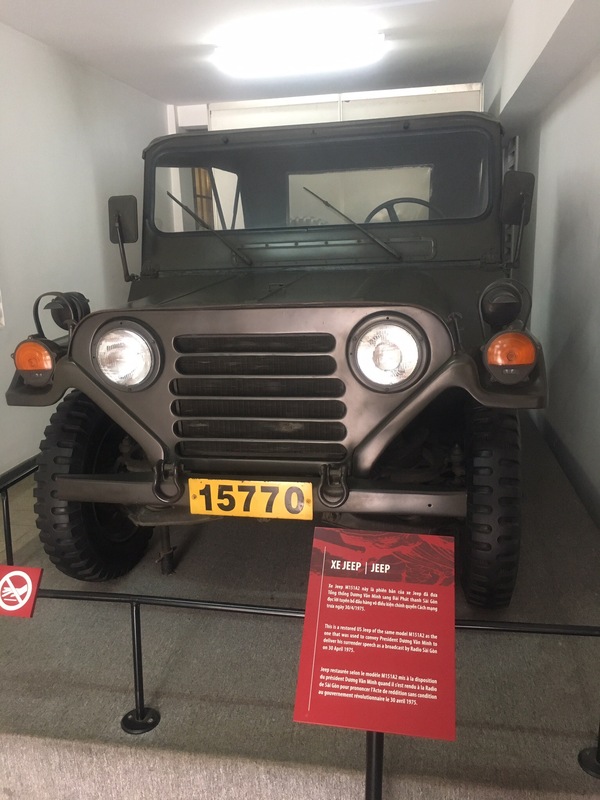 Housed in a massive french colonial mansion, that could use a good amount of TLC, the museum is full of artifacts related to the history of Ho Chi Minh City. 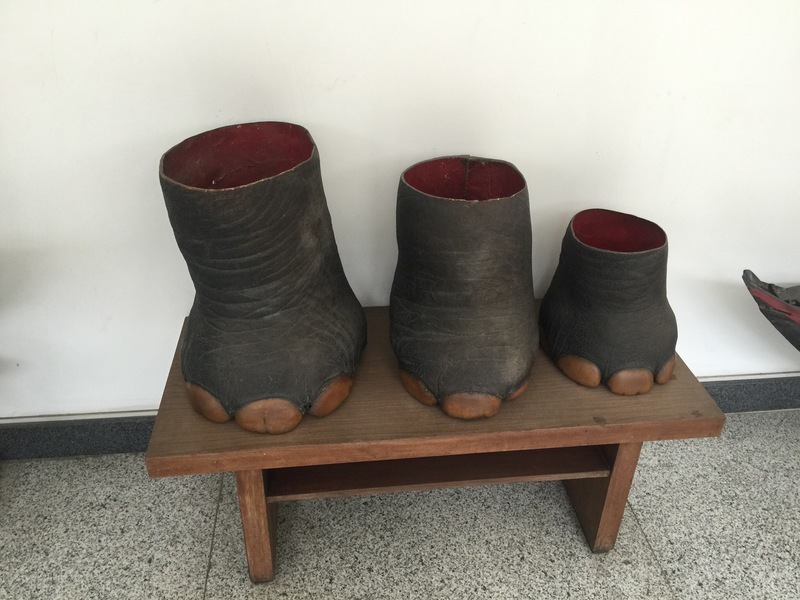 From the Ho Chi Minh Museum we walked to Independence Palace. Also known as Reunification palace, this was where the president of South Vietnam lived and worked during the Vietnam War. On April 30th, 1975 the Fall of Saigon occurred when a North Vietnamese Army Tank broke through the front gates at Independence Palace. The palace is large and modern, as it was built from 1962-1966 after being destroyed by a bombing in the beginning of the Vietnam War. The palace is no longer used by the president, as the capital of Vietnam is located in Hanoi. 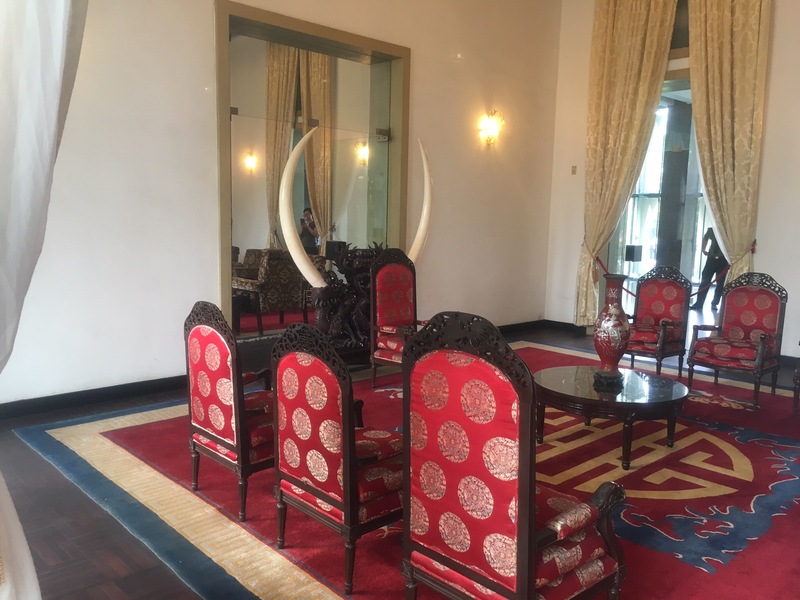 While walking through the palace we were able to see the president’s and vice president’s reception rooms, their quarters, the first lady’s reception room, a ballroom, and palace kitchen. 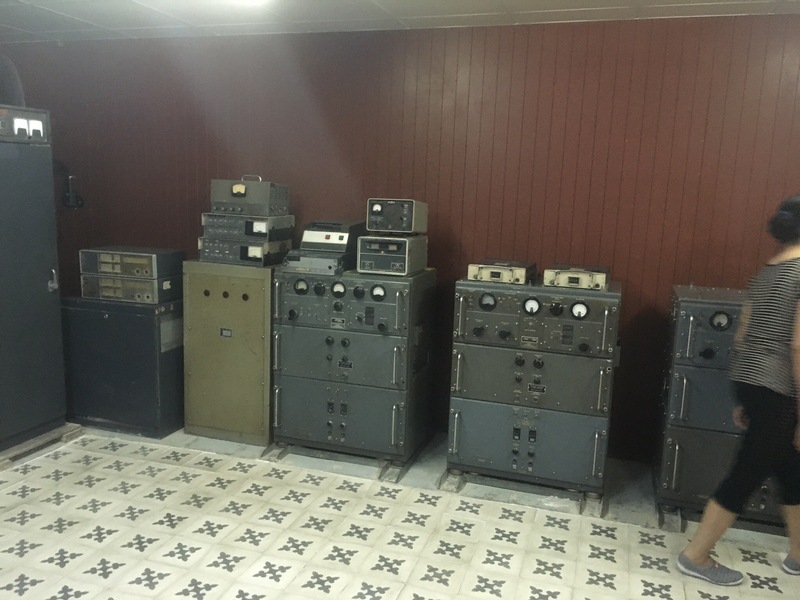 The top floor, which was originally designed as a mediation room, enclosed by blast proof glass on all four sides, was turned into a party room after a dance floor was added. 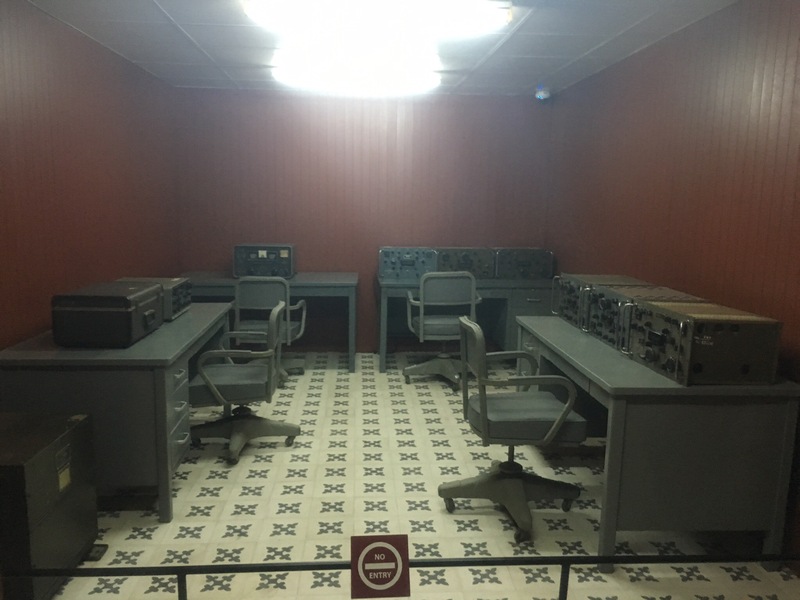 In addition, we walked through the bunker and were able to see where many decisions were made by the president of South Vietnam. 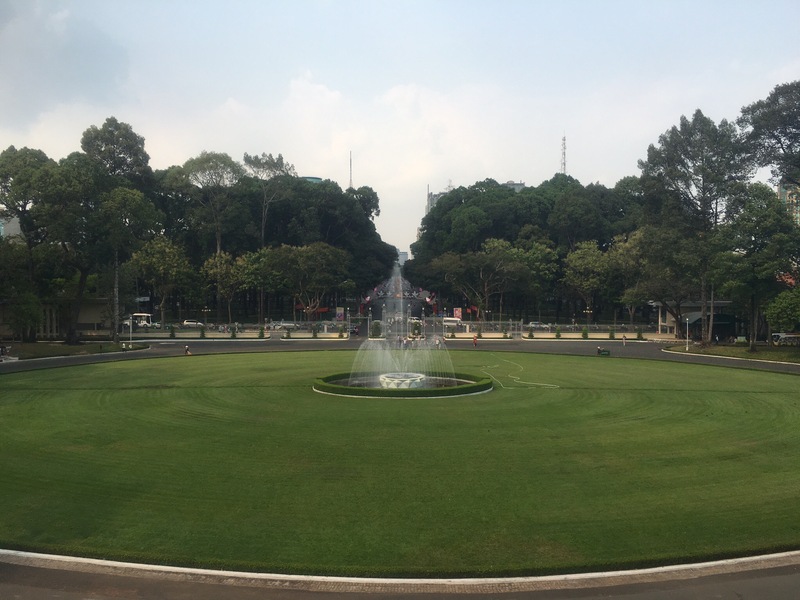 Entrance to the ground of independence palace cost 20,000 VND per person. It is definitely worth the look around and you are able to explore the beautiful grounds and garden surrounding the palace. 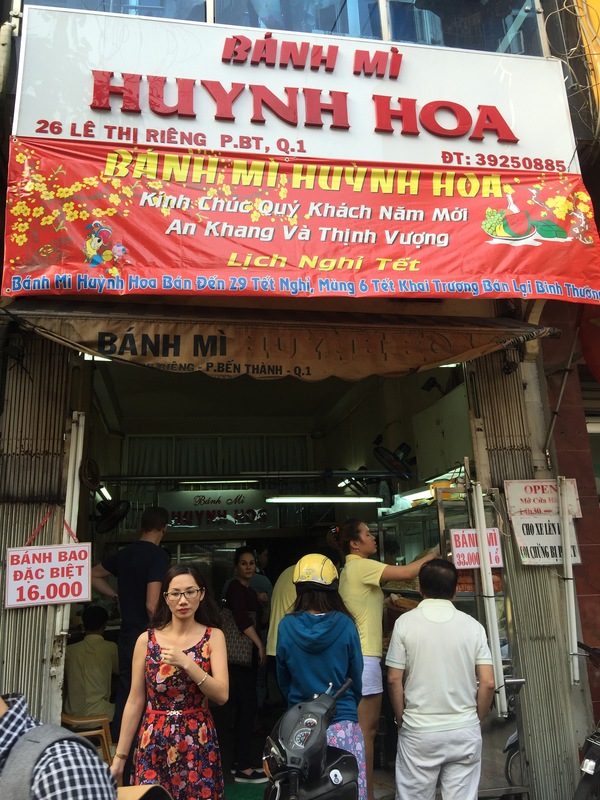 By now we were starting to get hungry and we had heard about an amazing Bahn Mi shop called Banh Mi Huynh Hoa (26 Le Thi Rieng, Ben Thanth, District 1,Ho Chi Minh City, Vietnam), which was just about to open (most Banh Mi shops open after 3pm). We walked to this Banh Mi shop, which was close to independence palace. Having just opened for the day, locals were starting to pour in and Banh Mi sandwiches were flying out the door at lightning speed. We asked a local woman what we should get and were told to get what she got: the special Banh Mi that has EVERYTHING inside it. While I can’t say exactly what was inside, it included pate, lunch meats, vegetables and herbs. The bread had a nice crispy outside but wasn’t chewy or hard to bite into as it had been warmed on a warmer minutes before slicing. It was the epitome of a perfect sandwich and was absolutely delicious. At only 42,000 VND ($1.88 USD) per sandwich, a meal (or two) here will definitely keep you in budget. If you’re only in Ho Chi Minh City for a day, this is THE place to go for a Banh Mi sandwich! 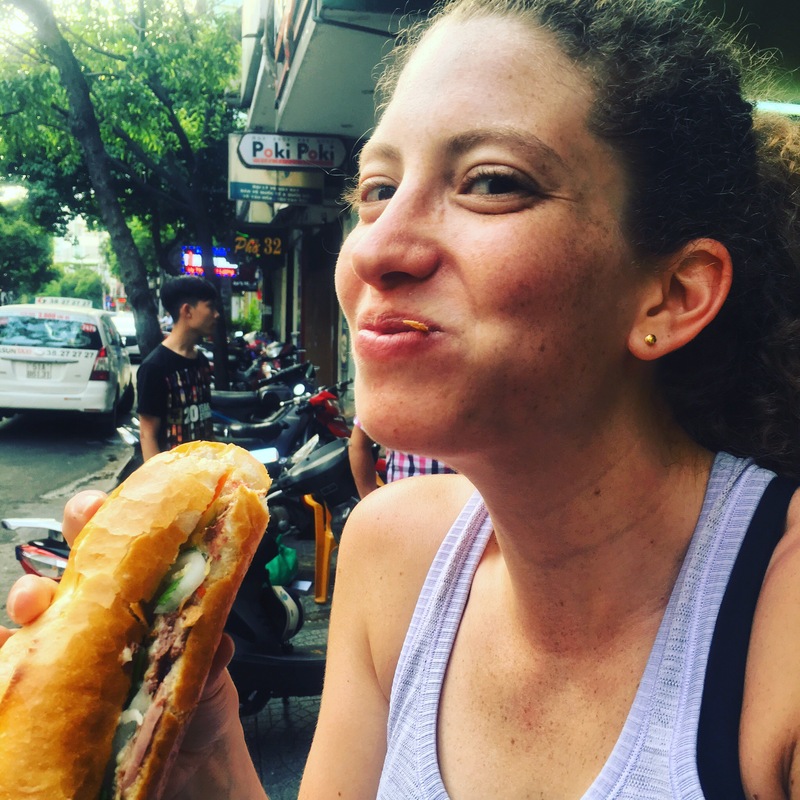 Having devoured our Banh Mi, and losing a few pounds to sweat in the 97F heat, we decided to head back to the hotel in an Uber, which ran us about $1.50 USD. 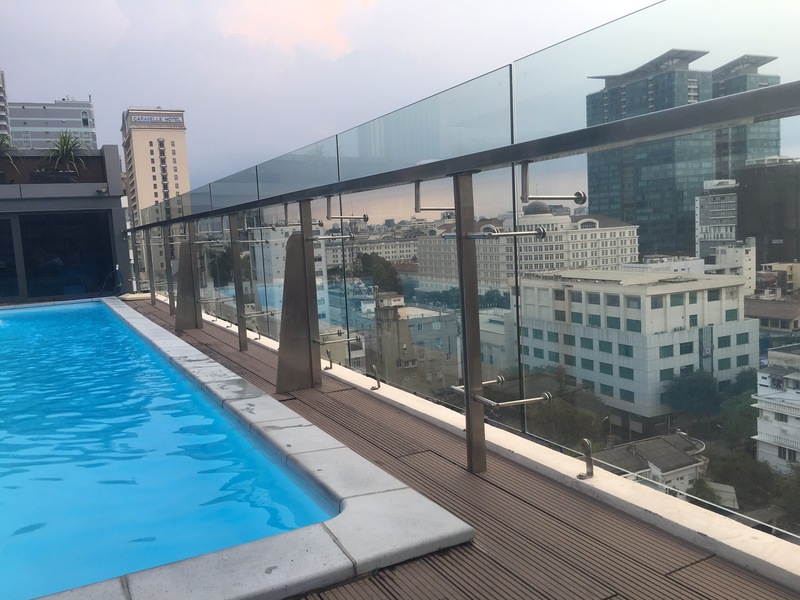 In need of a good cool down, we went up to the roof top pool at the Millennium Boutique Hotel for a quick dip and to watch the sunset over Saigon. After cooling down, we decided to see the Starlight Bridge and walk around the downtown area before going to bed. While the bridge was lit up, the waterfall on the bridge was never turned on. We have heard that this is not uncommon and we think it was because we were there on a weeknight and the area seemed pretty quiet for Ho Chi Minh City. When we got back to the hotel we both decided that we weren’t huge fans of Ho Chi Minh City. We can’t say why for sure, but a lot of it had to do with the fact that many of the attractions seemed repetitive. Also, even though there was more space and the motorbiking population was more spread out, the driving in Ho Chi Minh was even crazier than in Hanoi. With motorbikes racing by on sidewalks, in addition to the streets, you always had to be super aware of where you were walking. As such, we decided to leave Ho Chi Minh early, but we still wanted to see the Cu Chi Tunnels. We knew that if we took a regular tour to the tunnels, we would be late for the only afternoon bus to Phnom Penh and would have to stay another day in Ho Chi Minh City. We spoke with a tour company and for only $20 USD more than going with a group tour, we were able to arrange a private hire car and a private tour guide to see the Cu Chi Tunnels and make it back in time for the 12:30pm bus. We were picked up at our hotel at 6:00am to begin our journey to the Cu Chi Tunnels. Not only did we beat the rush hour traffic of people coming into the city for work, but we were also the first to arrive at the Cu Chi tunnels. We spent a little over one hour walking through the tunnels and learning about how the people of Cu Chi lived and fought underground. We also learned about the many brutal boobytraps they would set to slow the advance of the United States and its Southern Vietnamese Allies. The people of Cu Chi always tried to avoid fighting directly, as they were waiting for help from the Vietcong from the North Vietnamese Vietcong Soldiers. We even got to crawl through the tunnels, which we learned were widened to allow “western” tourists to fit inside. Even having been widened, the tunnels were extremely small. By the time were were done with our tour of the Cu Chi Tunnels, bus loads of organized tour groups were beginning to arrive. If you want to see the Cu Chi Tunnels, but don’t want to spend an entire day doing so, I would definitely recommend hiring a private tour. Also, by going to Cu Chi early in the day we were able to avoid the sweltering mid afternoon heat. Following our tour of Cu Chi we were dropped off at the Giant Ibis Bus Location around 10:45am with plenty of time to catch the 12:30pm bus to Phnom Penh. As we had time to kill, we walked around and got Banh Mi from a street cart, which didn’t come close the Banh Mi from Banh Mi Huynh Hoa. We also tried a pork bun and a coconut bun, which both happened to be delicious! When the bus arrived we tossed our bags underneath and found our assigned seats. The bus was clean, with comfortable leather seats that reclined to about 125 degrees. The bus was also equipped with wifi, which only worked on occasion and was very slow in addition to in-seat power. On the bus we met a pair of Scotts, Gillian and Gavin who said this was definitely nicer than the other busses they’ve taken so far. We planned to spend the next day in Phnom Penh with them and were excited to have new friends to explore the city with! Previous PostTuk Tuk for the day $30,Visiting ALL of the Sites in 16 Hours $50, Lunch and Dinner $10, New City and Great New Friends…PRICELESS!